Iraqi forces have since retaken several neighbourhoods despite bad weather that has hampered air support. 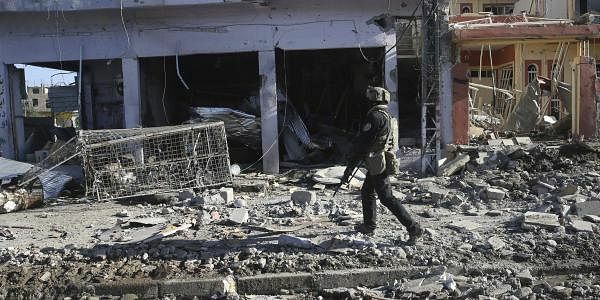 MOSUL: Iraqi forces said today they had seized ground inside Mosul's Old City, a district expected to see some of the fiercest clashes in the battle for the jihadist stronghold. An operation began on February 19 to retake Mosul's west, the last major Islamic State group urban bastion in the country, which includes the Old City. Iraqi forces have since retaken several neighbourhoods despite bad weather that has hampered air support. In the ancient central district, hundreds of thousands of civilians are believed to be trapped under IS rule in a warren of densely populated, narrow streets which restrict the use of large armoured vehicles. Federal police commander Lieutenant General Raed Shakir Jawdat said today that Iraqi forces backed by artillery and drones had advanced in the district. "Federal police and Rapid Response units imposed their complete control over the Al-Basha Mosque... and the Bab al-Saray market in the Old City," he said. The two sites lie on the edge of the district in the heart of Mosul, next to the Tigris river that slices the city in two. Further west, forces from the elite Counter-Terrorism Service have pushed into the Al-Rissala and Nablus quarters, senior commander Staff Lieutenant General Abdulghani al-Assadi said. "The situation is good," he said. The fall of Mosul, Iraq's second city, would be a major setback for IS following months of losses in Iraq and neighbouring Syria. But its loss would not mean the end of IS in Iraq, according to Emily Anagnostos of the Washington-based Institute for the Study of War. "The US and coalition will need to ensure their continued presence in Iraq after Mosul's recapture, which could occur within a month, in order to clear remaining ISIS-held areas and ensure stability in recaptured areas," she said in an online report, using another name for IS.